This is a traditional accompaniment to Indian food. I particularly like it with chicken tikka but it is a good way of cooling down the palate when eating any spicy dish. Peel the cucumber and then grate coarsely. Place the grated cucumber in a muslin bag and then squeeze until all of the water has been removed. Using a pestle and mortar grind the cumin seed and mustard seeds. Finely chop the green chilli. In a bowl place the yogurt, cucumber, salt, green chilli, ground cumin and mustard. Mix well and then taste to check the seasoning and chilli. If it is too mild add more chopped green chilli. If it is too hot you can either dilute it by adding a little more yogurt or simply add some seedless grapes to sweeten the dish. 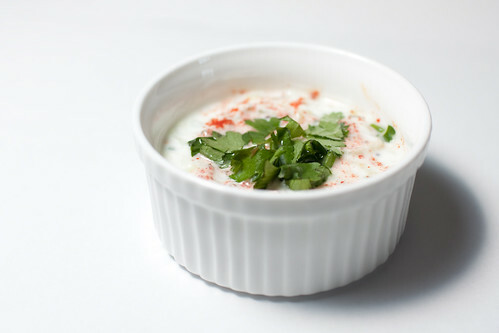 In both cases make sure that you taste the raita again afterwards and adjust the seasonings if required. Transfer into your serving dish and then garnish with the red chilli powder and coriander leaves. Leave to chill in the fridge until just before serving. You can use a grated carrot as either a partial or full substitute for the cucumber. There is no need to squeeze the grated carrot through a muslin bag. Another option if you have a sweet tooth is to add several halved seedless grapes to the raita. Another yummy treat - and necessary to have lots of this when serving western children! My only negative - too much salt. Maybe cut it half and let people season to taste? S&S pointed the way to your lovely blog - I love Indian food and am happy to find recipes that will help me become less dependent on meat for a meal. I particularly like the way you've set up the recipe index. I'll be back often!